As I was looking for my 3rd lost 1/4" presser foot, I came across this small cache of wooden spools. The loose ones were stolen from my grandmother's sewing basket at least 30 years ago, when her eyesight was so bad I knew she wouldn't be needing these anymore. And she'd never notice anyway. 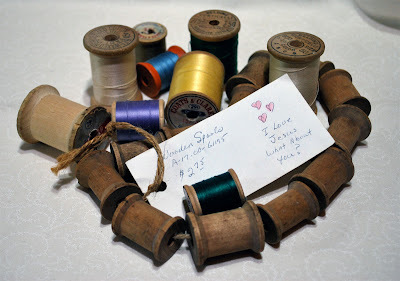 The spools on the twine were purchased at a tiny little antique/junque shop in Oklahoma. The sweetest couple ran the shop, and after sneezing my way through the years of dust, I came upon this little necklace of spools. I love the tag, too! I've got my mother's sewing basket around here somewhere...I bet there's more in there, too!